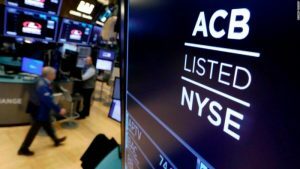 Aurora Cannabis, one of the biggest Canadian marijuana stocks, debuted on the New York Stock Exchange Tuesday and it didn’t go well. Shares quickly fell more than 15% before recovering towards the end of the day. Many of Aurora’s marijuana peers were tumbling sharply, too. Investors have been dumping cannabis stocks since Canada legalized recreational marijuanalast week. It’s a classic case of buying the rumor and selling the news, as many of them surged in the past few months. Shares of Canopy Growth (CGC), Cronos (CRON) and Tilray (TLRY) all fell about 10% Tuesday at one point. And each of them are down about 30% in the past five days. But Canopy Growth, which has a more than $4 billion investment from US beer giant Constellation Brands (STZ), has surged more than 50% in the past three months. Aurora (ACB), a company that has diverse operations throughout the cannabis industry — it’s been dubbed by some as the Berkshire Hathaway of pot — has been just as volatile. The company’s shares, which also list in Canada, have fallen 30% in the past week although they’re still up 45% in the past three months. Of course, it doesn’t help that the broader market has tanked in October because of concerns about slowing earnings growth and a trade war with China. But Canadian cannabis companies already may be running into concerns about over-saturation. How many cannabis companies does the world really need?